Just as expected based on pictures and description. Really liked the uniqueness of this canvas art. 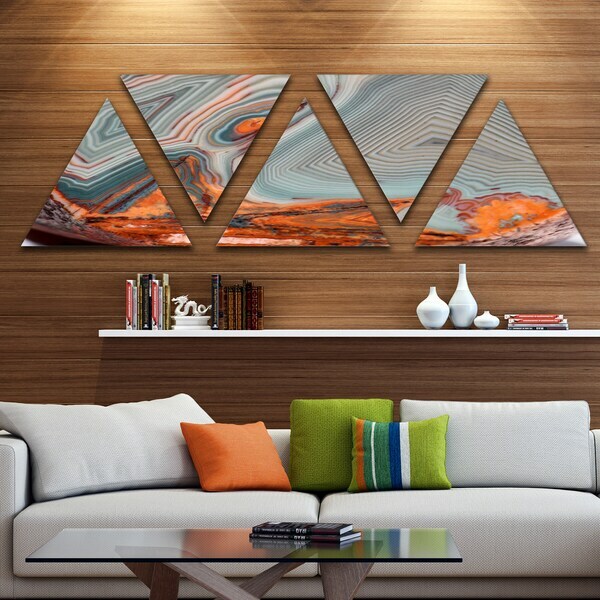 This Multipanel Triangle Canvas Art, is a composition of 5 triangle gallery wrapped canvas of 18"wide x 16"hide for a total size of 60"wide x 18"High. The 5 panels set is printed using the highest quality fade resistant ink on canvas. Every one of our fine art giclee canvas prints is printed on premium quality canvas, using the finest quality inks which will not fade over time. Each giclee print is stretched tightly over a 1 inch wood sub frame ensuring the canvas is taught and does not buckle. This canvas art print is gallery-wrapped (the design continues on the sides) , giving it a real art gallery feel. All of our canvas prints are carefully packaged in inflated cushion wrap, fragile labeling and sturdy boxes to ensure a safe delivery. Every canvas print arrives ready to hang on the wall, with the hanging kits included. We recommend to have a 2.5 to 3" between each panels to follow the design of this contemporary Canvas Art print. The installation is simple with inscription and hanging kit included. In the photo this appears to have a lot of blue in it. I was very disappointed to see that it is really grey and orange. There is hardly any blue in it. I see now that a companion piece to this on wood is described in the details as Grey but this has no color description. I was looking for something to tie together blue and orange that are already existing in the space but this did not accomplish that.